John Owen was one of the most significant figures in Reformed Orthodox theology during the Seventeenth Century, exerting considerable religious and political influence in the context of the British Civil War and Interregnum. 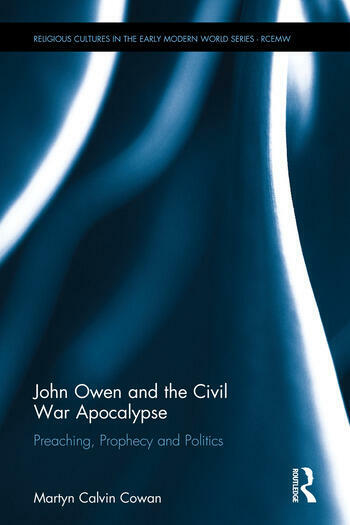 Using Owen’s sermons from this period as a window into the mind of a self-proclaimed prophet, this book studies how his apocalyptic interpretation of contemporary events led to him making public calls for radical political and cultural change. Owen believed he was ministering at a unique moment in history, and so the historical context in which he writes must be equally considered alongside the theological lineage that he draws upon. Combining these elements, this book allows for a more nuanced interpretation of Owen’s ministry that encompasses his lofty spiritual thought as well as his passionate concerns with more corporeal events. This book represents part of a new historical turn in Owen Studies and will be of significant interest to scholars of theological history as well as Early Modern historians. Martyn Cowan is a Lecturer in Historical Theology at Union Theological College, Northern Ireland.